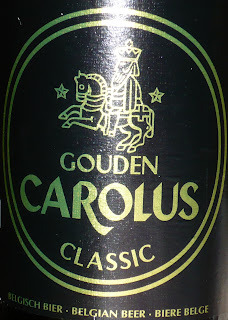 This dark beer, Gouden Carolus Classic, is indeed pretty tasty. Caramel, to be sure. And smoky. Something vegetable in there, too -- tomato soup? A very slight hint of aniseed in the aftertaste, we both agree. Nicely balanced flavours. Absolutely lovely. Very glad we’re working from a 75cl bottle tonight. This beer is produced by Het Anker brewery in the city of Mechelen, the former capital, which lies between Brussels and Antwerp and is supposed to be well worth a visit. We still haven’t been there, despite living here for four and a half years. Pathetic, really. So, we’re now making plans to go... to visit the brewery/restaurant where this beer is produced if nothing else. The 40b40is in the homestretch. We now only have a few days left to run, and donations to the cause are just over a third of the goal. Not too bad, as I’ve still to call in a number of promises people have made to me over the past month or so. If you are one of those waiting until the final days of this thing before contributing, your time is now.